Boiler and furnace diesel oil additive. Includes biocides. Power plant, marine and machinery diesel oil additive. Includes biocides. Intermediate Fuel Oil IFO additive. For Diesel engines. Special NONFLAMMABLE. Includes biocides. 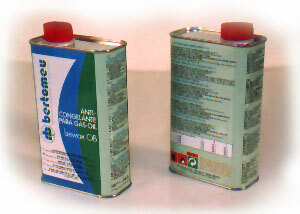 Fuel saving · Reduction of emissions of CO and unburnt particles · Decants water from diesel oil at the tanks· Continuous filter cleaning · Injectors continuous cleaning · Avoids carbon build up in burners · Decreased corrosion in engines · Decreased incrustations in boiler pipes · Reduction of breakdowns · Includes algaecides and biocides (except "bewax OB") · Anti-freezing action of "bewax OB"
rb bertomeu, SL. Manufacturer of additives for Heavy fuel oil and Crude oil.